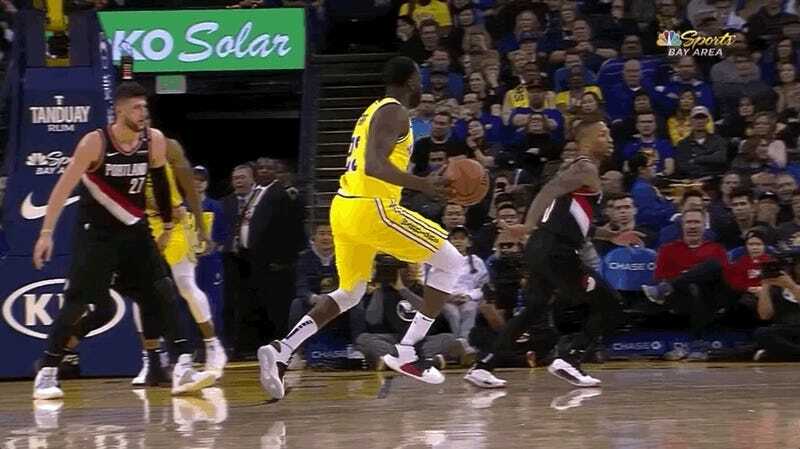 The Warriors lost their second consecutive home game Thursday night, in a thrilling 110–109 overtime affair against the Portland Trail Blazers. Eventually none of this will matter, when the Warriors win the title and we all reflect on this time as a goofy period of intensely embarrassing overreaction, but for now let us bask in the warming glow of their struggles together, in these otherwise dismal times. Last season none of this would’ve stopped the Warriors from winning this game with an infuriating overtime spurt; two seasons ago they would’ve won it in regulation by 35 and sat their starters in the fourth quarter. This season they shat their brains out in overtime and the visitors made the clutch plays, including an insanely tough quick-release game-winning three-pointer by Damian Lillard off a dumb scramble—exactly the sort of play Steph Curry has spent his career turning from a highlight into a layup. The Warriors are good now. Go Warriors!